Microrep Precision (M) Sdn. Bhd. was founded in April-1998 (formerly known as Microrep Precision Enterprise, from 1996 to 1998), is a locally registered Malaysian company that supplies precision measuring instrument, most kind of precision thread and plain limit gauges. Our main office is located in Petaling Jaya (PJ), Selangor, Malaysia. We supply our products for industries such as engineering work, metal machining, manufacturing, oil and gas and many others engineering requirements. In 2001, Microrep Precision (M) Sdn. Bhd. was established Microrep Calibration Laboratory to cater and support the industries calibration needs. Over the years, our calibration services have been developed to cater great demand from customers. 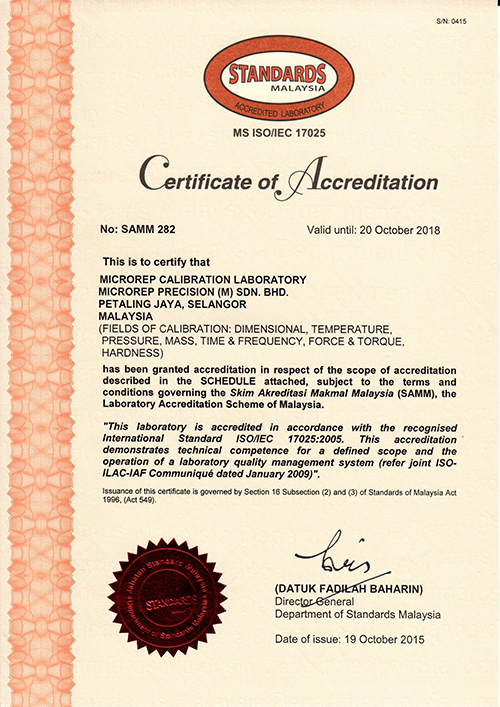 Microrep Calibration Laboratory has achieve MS ISO/IEC 17025 Accreditation by STANDARD MALAYSIA in October-2004. The company has made a move ahead in line with country’s industrial growth. It is the policy of Microrep Precision (M) Sdn Bhd to extent our fullest co-operation, prompt and accurate services to our customer.